Background: Relatively rare scarce number of flaps are used to repair composite defects occurring as a consequence of finger injuries. The main objective in this study is reconstruction of the composite defects of the fingers to share in our study; we aimed to transfer our the experience with the use of the free perforator flap of the radial artery superficial palmar branch (SUPBRA). Materials and Methods: A total of 10 (three women and seven men; age between range, 18 and 47 years) patients who had undergone free composite SUBPRA flap reconstruction, operations between 2010 and 2013 were included in the study. Defect sizes ranged between from 2 cm × 3 cm to 3 cm × 5 cm. The patients were followed up postoperatively for a median an average period of 11.5 (six-18 months) months. All patients were assessed with static and dynamic two-point discrimination tests, Semmes-Weinstein monofilament test, cold intolerance test, time of returning to work, the active total range of motion of the injured fingers, cosmetic appearance of the donor/recipient sites and were also assessed for neuroma the development of neuroma on the donor site. Results: All composite free flaps survived completely, and the follow-up duration was 11.5 months. The average median operative time was 194 min (180–260 min) and the patients returned to their work their normal life after an average of 13 weeks (11–21). Any complication concerning with donor sites and wrist movements when primary closures were performed was observed. Conclusion: Free SUBPRA flap can be elevated from ipsilateral extremity under regional anesthesia which can be easily used for the reconstruction of composite defects with an advantage of providing a relatively hairless and thinner coverage. Therefore, it can be a perfect alternative for the repair of composite tissue defects encountered in the practice of hand surgery. Finger defects can be repaired with secondary healing, local or regional flaps, or distant or regional-free flaps.,,,,,,,,, The objective in reconstruction is to close the defect area, allowing tendon mobility, and recovery of sensory conduction of the repaired tissue. In defects involving skin reconstruction, the reconstruction can be rapidly and easily accomplished using local and regional flaps. Despite its two advantages as cost-effectiveness and shortness of the procedure, there are also several disadvantages such as restricted flap advancement, inadequate flap size relative to the defective area, sensory dysfunction of the flap, joint rigidity, venous problems, neuroma formation, and donor site morbidities., Therefore, regional and distant flaps have been described to be required for larger defects. Although a great number of alternatives are available for soft-tissue reconstruction in composite finger injuries (involving skin, bone, tendon, vessel, and nerve) free flaps to be used are harvested from lower extremities., Because of the delay in healing of the donor site and initiation of the finger movements of the patient at a later stage and presence of a hypertrophic scar and the donor site morbidity, these flaps are preferred at a lower rate. In the this study, our main objective is to report short-and long-term outcomes of reperation of composite defects of fingers using free SUPBRA flaps. All patients were provided with information about the surgical techniques before operation, and their consent was obtained and maintained in accordance with the principles of the World Medical Association's Declaration of Helsinki for “Ethical Principles for Medical Research Involving Human Subjects” (amended in October 2013). This study examined 10 patients (three women and seven men) with ages ranging between 18 and 47 years who received free composite SUPBRA flaps between 2010 and 2013. All traumatic cases were due to workplace accidents. Injuries were classified as crushing (n = 4), degloving (n = 1) and uncontaminated injuries and clean cuts (n = 5). Defect sizes ranged from 2 cm × 3 cm to 3 cm × 5 cm. The patients were followed for 11.5 (6–18 months). The mean hospitalization period was three (2–5) days. The patients who underwent bone fixation were rehabilitated for 5 weeks, while those who did not were included in another rehabilitation program that lasted five weeks. All patients were evaluated using static and dynamic two-point discrimination tests, Semmes-Weinstein monofilament test, active total range of motion (ROM) of the injured fingers, cold intolerance, and neuroma development on donor site. Besides, the visual analog scale (VAS) was applied for the evaluation of flaps and donor sites. VAS scores of smaller than five, five-seven, and eight-ten points were evaluated as unacceptable, acceptable, and good outcomes, respectively. The Statistical Package for Social Sciences (IBM SPSS Inc.; 23.0, Chicago, IL, USA) was used for statistical analysis of all data. The data were assessed using descriptive statistics (frequency, percentage, mean, standard deviation, median, and min-max). The size of the flap was delineated to be 3–5 mm larger than the defect diameter so as to cover the defects without tension. Before elevation of the flap under axillary block, we performed anesthesia and tourniquet application, debridement of the recipient site, fixation of soft tissues, preparation of one artery and two veins of the recipient site and preparation of the digital nerve for coaptation of nerves [Figure 1]. Superficial veins were identified following incision that was made distal to the volar wrist line. A more laterally placed radial artery was found, and dissection was extended distally to the artery. The origin of the SUPBRA was identified, and the dissection was extended further to include veins accompanying the pedicle in the flap. For the sensate flap, the palmar cutaneous branch of the median nerve was included in the flap. For reconstruction of the tendon or the ligament, following dissection of palmaris longus tendon and then veins toward the proximal part of the forearm which should occupy in the central part of the flap, superficial veinswere also dissected from the distal to the volar wrist line toward the thenar region and included in the flap. If a long pedicled or a flow-through flap would be designed, incision on the thenar region was advanced further, and the artery was followed up to this region. Excluding the arterial pedicles, all anatomical structures were incised from their identified locations and tourniquets were removed. Under microscopic examination, anastomosis of one artery and two veins, nerve coaptation, tendon, and ligament repair was observed. Donor sites were closed primarily during operation; the patients received one cc (5000 IU) heparin (Nevparin, MN Pharma, Istanbul, Turkey) injections. During the 1st postoperative month, all patients received single doses of 100 mg acetylsalicylic acid (Aspirin, Bayer Pharma, Germany). An 18-year-old male patient had a bone defect at the back of the middle phalanx of the third finger of his right hand, dorsal ligament defect, and intrinsic extensor tendon defects [Figure 2]a. Debridement revealed a defect with a size of nearly 2.5 cm × 4.5 cm [Figure 2]b. Free SUPBRA flap was elevated together with palmaris longus tendon and skin island measuring 3 cm × 5 cm [Figure 2]c. Dorsal tendon system intrinsic extensor tendon defects were repaired using palmaris longus tendon. Pedicle of the flap was anastomosed to the digital artery. Palmar cutaneous branch of the median nerve was coapted to the digital nerve. Two veins from the superficial venous plexus were anastomosed to dorsal veins. The operation time lasted nearly 180 min. The patient was discharged on the 3rd postoperative day. [Figure 2]d and e show the appearance of the fingers in the 6th postoperative month. A 28-year-old male patient had injured middle phalanx of the second digit of his right hand. He had a skin defect measuring 2.5 cm × 4 cm and a nearly 2-cm defect involving flexor digitorum profundus and radial side of the digital artery and digital nerve [Figure 3]a. Distal and proximal-free SUPBRA flap was elevated together with a 3 cm × 4.5 cm skin island including the tendon of palmaris longus, the palmar cutaneous branch of the median nerve so as to achieve a flow-through flap [Figure 3]b and [Figure 3]c. The tendon defect was repaired in the palmaris longus tendon. 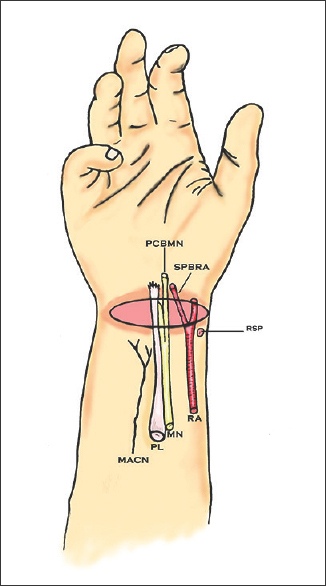 The digital nerve was repaired using a palmar cutaneous branch of the median nerve. The digital artery defect was repaired using an orthodromic (flow-through) island flap. Two superficial veins were anastomosed. Images of the finger at 8 months after initial surgery may be seen in [Figure 3]d-[Figure 3]e.
All of the applied ten composite free flaps survived. The median value for the operation time was 194 min (180–260 min) and the patients returned to their work and their normal daily life in a median postoperative time of 5 months (4–8 months). No problem was observed. No problems or complications occurred in any of the primarily closed donor sites or in wrist movements. Donor site scars were evaluated as good (n = 3), acceptable (n = 5) and unacceptable (n = 2) by the patients. Median measurements in static and dynamic two-point discrimination tests were 7.9 mm (6–11 mm) and 6.1 mm (5–8 mm), respectively. The Semmes-Weinstein test results were determined as follows: normal (green: Two fingers), residual texture (blue: Four fingers), residual protective sensation (purple: Three fingers) and loss of protective sensation (one patient). Active ROM of the reconstructed fingers was evaluated as 71.6° (65°–80°) for the metacarpophalangeal joint, 83.2° (74°–94°) for the proximal interphalangeal joint and 70.5° (64°–77°) for the distal interphalangeal joint. Almost full active ROM was obtained in all the reconstructed fingers. Cold intolerance was not observed in six patients, while mild (n = 2), moderate (n = 1) and severe (n = 1) degrees of cold intolerance were seen in some patients. Neuroma development was not observed in any of the donor sites. Reconstruction of the composite defects of fingers is still a challenging field in the field of hand surgery. A local flap which may be used to repair composite defects involving bone, tendon or nerves is not available yet. For the repair of composite lower extremity defects involving bone, tendon and/or nerves, free flaps can provide a perfect support. However, they have some disadvantages such as requirement of general anesthesia, donor site tissue incompatibility, and patient's delayed return to his/her daily activities. However, SUPBRA flap is a good alternative in reconstruction of composite defects of the finger than a flap from the lower extremity due to similarity between tissues of the defect and flap with its better histocompatibility, application of this procedure under regional anesthesia, and earlier rehabilitation combined with minimal donor site disadvantage. For repairing finger defects, previously, SUPBRA flap was elevated vertically.,, In the year 2003, Sakai designed a transverse elevation method and used a free SUPBRA flap. In some studies, the distance between the SUPBRA and volar wrist line was measured as 17–18 mm.,,, The diameter of the SUPBRA was found to vary between 0.9 and 1.4 mm.,, The diameter of SUPBRA is suitable for digital arterial anastomosis. These measurements are closer to the diameter of the digital artery which makes SUPBRA an ideal free flap for repairing digital defects and facilitating anastomosis. 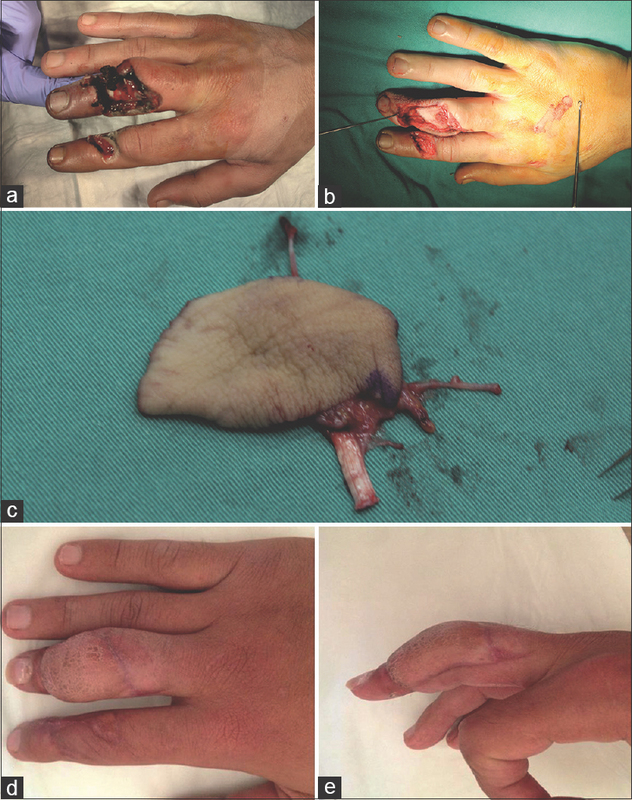 The superficial palmar branch of the radial artery flap is an ideal flap for flow-through arterial reconstruction. Its proximal and distal parts can be elevated. If elevation of a longer pedicle is intended, distal SUPBRA can be dissected up to its junction with the superficial palmar arch. Since it is a reverse-elevated flap, both of these arteries can be utilized relatively safely for anastomosis.,, At this site, venous flaps can be used as a flow-through alternative. However, venous valves may cause an increase in complication risks. Flaps like posterior interosseous artery perforator or ulnar artery perforator flaps does not suitable for flow-through free flap reconstruction. Therefore, we used SUPBRA flow-through flap in our study in five patients, and we did not observe any arterial complications. The superficial palmar branch of the radial artery flap has two venous systems. One of them accompanies the arterial pedicle of the flap and the other consists of superficial veins. Based on the status of the recipient site, these two systems can be used simultaneously or separately. In our cases in general, two veins were used for a single artery, and the superficial vein at the midline was anastomosed to the vein accompanying the pedicle. In reconstruction of defects involving tendons or ligaments, the tendon of palmaris longus can be included in the flap., The positions of the skin defect and the tendon should be carefully adjusted when a vascularized tendon flap is used for the repair. When distal veins are used in venous flaps for anastomosis of the artery, placement of tendon elevated together with the flap restricts ROM. Since both proximal and distal arteries can be used in SUPBRA, it is an ideal flap for tendon transfer. Therefore, in repairing defects measuring over 2 cm, it can be easily included in the tendon flap. Skin sensation was ensured by three different alternatives, namely, inclusion of the palmar cutaneous branch of the median nerve, lateral antebrachial branch of the cutaneous nerve, or sensory branch of the radial nerve in SUPBRA flap.,, Inclusion of the palmar cutaneous branch of the median nerve in the flap impairs sensory functions of the wrist region and volar aspect of the wrist. Therefore, some studies have demonstrated elevating the flap from a more radial site that includes many other nerves in the flap. In various studies where all three nerves were included in the flap, significant differences were not detected regarding skin sensation.,,, Neuroma formation is another problematic issue. Especially in cases where the palmar cutaneous nerve was not used, this possibility of complication is encountered more frequently. Therefore, in cases where other nerves are included in the flap, embedment of the proximal segment of the nerve in the donor site in the brachioradialis muscle was recommended. In our study, we preferred using the palmar cutaneous branch of the median nerve. Consequently, we did not observe neuroma formation at the donor site of any patients. Excluding one case, the sensory functions of all of our all patients were recovered. In studies that compared free flaps elevated at the level of the forearm (venous flap, SUPBRA, posterior interosseous perforator flap, and ulnar artery perforator flap), authors have demonstrated SUPBRA flap to be superior to others with respect to recovery of sensory functions. Elevation of a thinner flap, which results in enhanced innervation supplied by surrounding tissues, was pointed out as the main reason for these successful outcomes. Despite all advantages of SUPBRA flap, it has many disadvantages such as small size of the proximal pedicle, anastomosis performed at the traumatic recipient site, increase in the possibility of thrombus formation, deformation of the design of the distally based flap to be elevated, very large skin island, experience required for the flap elevation and anastomosis, as well as necessity of microsurgical instruments and visible scar on the wrist. In composite defects of fingers, no technique for bone reconstruction has been described in the literature yet. It is difficult to harvest vascularized bone grafts from distant regions for reconstruction of digital defects. Besides, it might not be always possible to design the bone as a smaller anatomical structure and elevate it with technical vascularized bone grafts from the palmar carpal artery arising from the radial artery for repairing nonunion or malunion of scaphoid bones. After leaving radial artery, SUPBRA gives branches to the carpal bones. It constructs an arterial network with the carpal arch and the palmar carpal artery overlying the radial bone, and from that artery, its branches extend up to the periosteum of the radial bone. Cosmetic appearance of the flap recipient and donor site carries the main importance. Transverse scar settles on the fold line of the volar aspect of the wrist and leads to a formation of a cosmetically better/tolerable scar. However, since this scar resembles a scar created by people who have attempted suicide (wrist-cutting), patients may feel uneasy. In our series, three patients found its scar as fine (n = 3), acceptable (n = 5), and unacceptable (n = 2). The latter two cases were young patients, and donor site scars were more conspicuous. Scar revision was offered to all patients; however, they declined further interventions. On the recipient site, when compared with other flaps, a thinner, hairless and easily-shaped flap on the recipient site offers better tissue compliance. Besides, this flap does not contain excess tissue and hence thinning procedure is not performed, making it both more time-and cost-effective, which does not incur additional costs. The superficial palmar branch of the radial artery free flap can be elevated from the ipsilateral extremity under regional anesthesia. This flap can be easily used for reconstruction of composite defects involving various anatomical structures as skin-bone-nerve or tendon with an advantage of providing a relatively hairless and thinner coverage. Therefore, it can be considered as a good alternative for repairing composite tissue defects in hand surgery. Abbase EH, Tadjalli HE, Shenaq SM. Fingertip and nail bed injuries. Repair techniques for optimum outcome. Postgrad Med 1995;98:217-9, 223-4, 230. Al-Qattan MM. The adipofascial turnover flap for coverage of the exposed distal interphalangeal joint of the fingers and interphalangeal joint of the thumb. J Hand Surg Am 2001;26:1116-9. Atasoy E. Reversed cross-finger subcutaneous flap. J Hand Surg Am 1982;7:481-3. Benito JR, Ferreres A, Rodriguez-Baeza A, Monner J, Paloma V, Serra JM, et al. Is the reversed fourth dorsal metacarpal flap reliable? J Hand Surg Br 2000;25:135-9. Chen SL, Chou TD, Chen SG, Cheng TY, Chen TM, Wang HJ, et al. The boomerang flap in managing injuries of the dorsum of the distal phalanx. Plast Reconstr Surg 2000;106:834-9. Wray RC, Wise DM, Young VL, Weeks PM. The groin flap in severe hand injuries. Ann Plast Surg 1982;9:459-62. Foucher G, van Genechten F, Merle N, Michon J. A compound radial artery forearm flap in hand surgery: An original modification of the Chinese forearm flap. Br J Plast Surg 1984;37:139-48. Tare M, Ramakrishnan V. Free 'mini' groin flap for digital resurfacing. J Hand Surg Eur Vol 2009;34:336-42. Nakazawa H, Nozaki M, Kikuchi Y, Honda T, Isago T, Sasaki K, et al. Successful reconstruction of the ring finger using a twisted toe flap. J Reconstr Microsurg 2004;20:615-9. Yang JW, Kim JS, Lee DC, Ki SH, Roh SY, Abdullah S, et al. The radial artery superficial palmar branch flap: a modified free thenar flap with constant innervation. J Reconstr Microsurg. 2010;26:529-38. Rehim SA, Kowalski E, Chung KC. Enhancing aesthetic outcomes of soft-tissue coverage of the hand. Plast Reconstr Surg 2015;135:413e-28e. Gu JX, Pan JB, Liu HJ, Zhang NC, Tian H, Zhang WZ, et al. Aesthetic and sensory reconstruction of finger pulp defects using free toe flaps. Aesthetic Plast Surg 2014;38:156-63. Tuncer S, Sezgin B, Kucuker I, Kaya B, Ayhan S. Reconstruction of the left thumb with a second toe transfer in a musician's hand. J Plast Surg Hand Surg 2014;48:444-8. Orbay JL, Rosen JG, Khouri RK, Indriago I. The glabrous palmar flap: The new free or reversed pedicled palmar fasciocutaneous flap for volar hand reconstruction. Tech Hand Up Extrem Surg 2009;13:145-50. Omokawa S, Ryu J, Tang JB, Han J. Vascular and neural anatomy of the thenar area of the hand: Its surgical applications. Plast Reconstr Surg 1997;99:116-21. Kamei K, Shimada K, Kimura T, Ueno T. Substantial volar defects of the fingers treated with free thenar flaps. Scand J Plast Reconstr Surg Hand Surg 1997;31:87-90. Kamei K, Ide Y, Kimura T. A new free thenar flap. Plast Reconstr Surg 1993;92:1380-4. Iwuagwu FC, Orkar SK, Siddiqui A. Reconstruction of volar skin and soft tissue defects of the digits including the pulp: Experience with the free SUPBRA flap. J Plast Reconstr Aesthet Surg 2015;68:26-34. Iwuagwu F, Siddiqui A. Pedicled (antegrade) SUPBRA flap – For wound cover on volar aspect of thumb. J Plast Reconstr Aesthet Surg 2012;65:678-80. Sakai S. Free flap from the flexor aspect of the wrist for resurfacing defects of the hand and fingers. Plast Reconstr Surg 2003;111:1412-20. Lee TP, Liao CY, Wu IC, Yu CC, Chen SG. Free flap from the superficial palmar branch of the radial artery (SPBRA flap) for finger reconstruction. J Trauma 2009;66:1173-9. Olave E, Prates JC, Gabrielli C, Del Sol M, Mandiola E. Abnormal course of the superficial palmar branch of the radial artery. Surg Radiol Anat 1996;18:151-3. Liu Y, Jiao H, Ji X, Liu C, Zhong X, Zhang H, et al. Acomparative study of four types of free flaps from the ipsilateral extremity for finger reconstruction. PLoS One 2014;9:e104014. Yoshimura M, Shimada T, Imura S, Shimamura K, Yamauchi S. The venous skin graft method for repairing skin defects of the fingers. Plast Reconstr Surg 1987;79:243-50. Sheetz KK, Bishop AT, Berger RA. The arterial blood supply of the distal radius and ulna and its potential use in vascularized pedicled bone grafts. 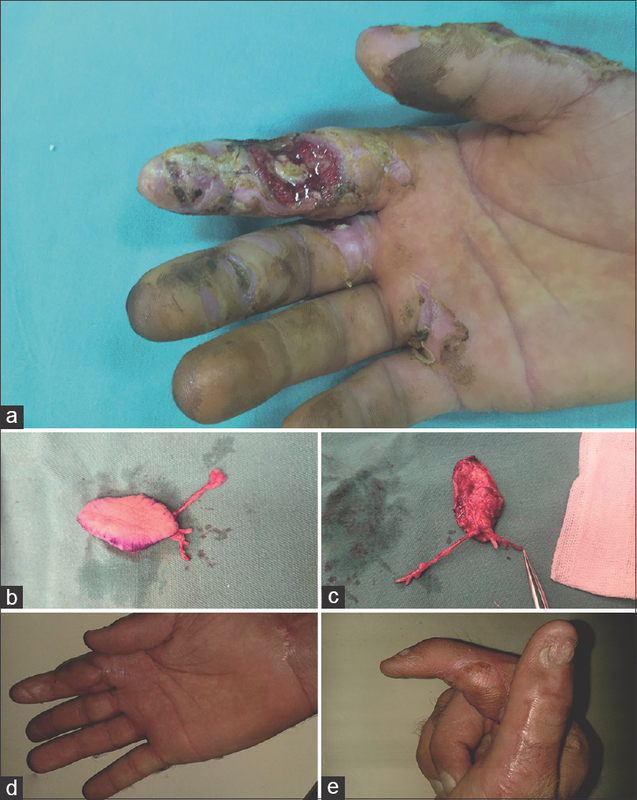 J Hand Surg Am 1995;20:902-14.